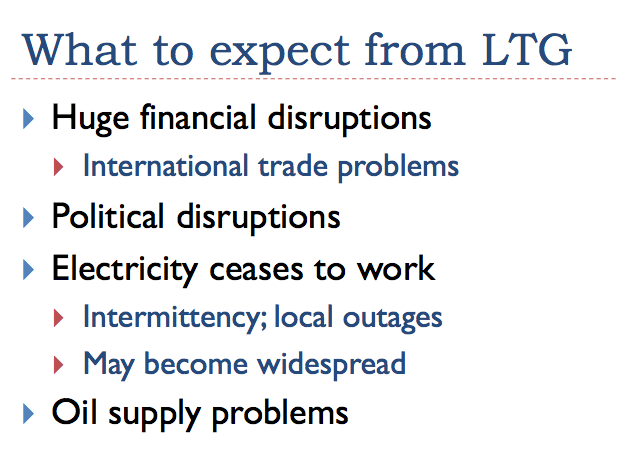 What the short-term financial impacts might be (Slides 12-17). I have written about Limits to Growth previously. See this post for a longer version of why I believe we are reaching limits to growth. 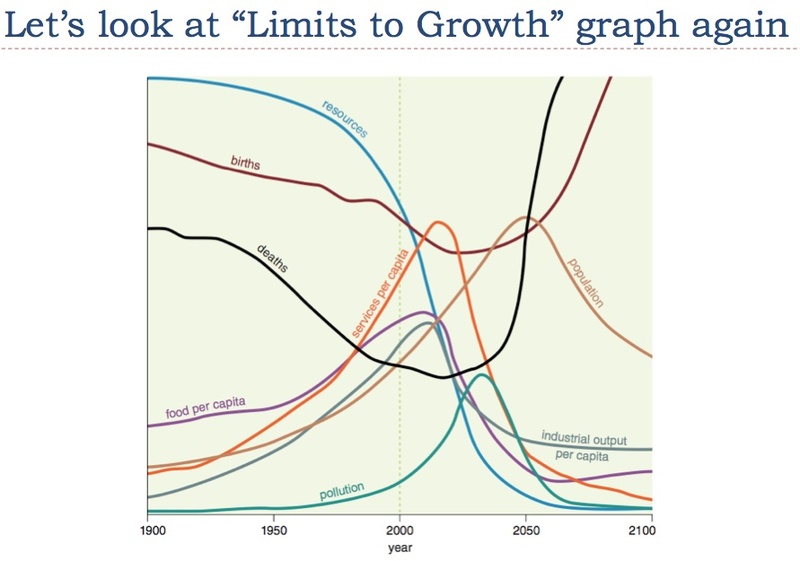 A PDF version of the slides can be found at this link: Financial Impacts of Reaching Limits to Growth. Slide 2 – High oil prices lead to people to cut back on their demand for discretionary goods and employers to lay off unnecessary workers. These actions lead to constriction on economic growth. This issue seems to me to be the first stage of “Limits to Growth” as foretold by the 1972 book by that name. People who are looking for oil limit problems to start when oil supply actually starts declining may miss this connection. 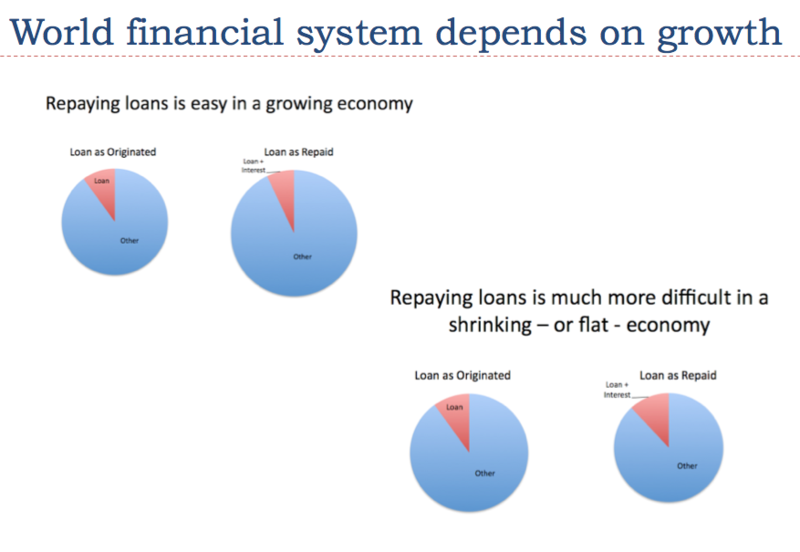 Slide 3 – In a growing economy, when it comes time to pay back debt with interest, borrowers, on average, have more resources than when they took out the loans. They can use these extra funds to help handle interest payments, and still have sufficient funds for their other obligations. The reverse happens in a declining economy. Slide 4 – Reinhart and Rogoff are well-known researchers with respect to defaults on sovereign debt. In a paper they wrote, they made the observation above, saying that it was only the countries that were growing that did not default on their debt. They did not seem to understand why this connection would hold, but the connection I pointed out in Slide 3 is the reason we would expect this situation to hold. Slide 5 – World oil supply has remained relatively flat for the last few years, despite wild gyrations in prices. Theoretically, if investment had ramped up high enough, fast enough, oil production might have kept rising fast enough to keep price relatively level. 1. Prior to the green dot in 2003 – Time when oil supply followed demand–something that the EIA assumes still happens today. In such a situation, if economies are expanding and need more oil, it will be supplied. 2. Between the green dot in 2003 and the green dot in 2008 – Time when growth in supply stopped keeping up with world demand at historical prices. Prices rose higher and higher, to choke back demand to match supply through higher prices. 3. Subsequent to the green dot in 2008 – Time when inadequate oil supply started affecting the economy in additional ways, besides leading to higher prices. Additional impacts included recession and, as we will see on Slide 8, reduction in non-governmental debt. During this period, oil price decreased, then rose again, as demand again built. 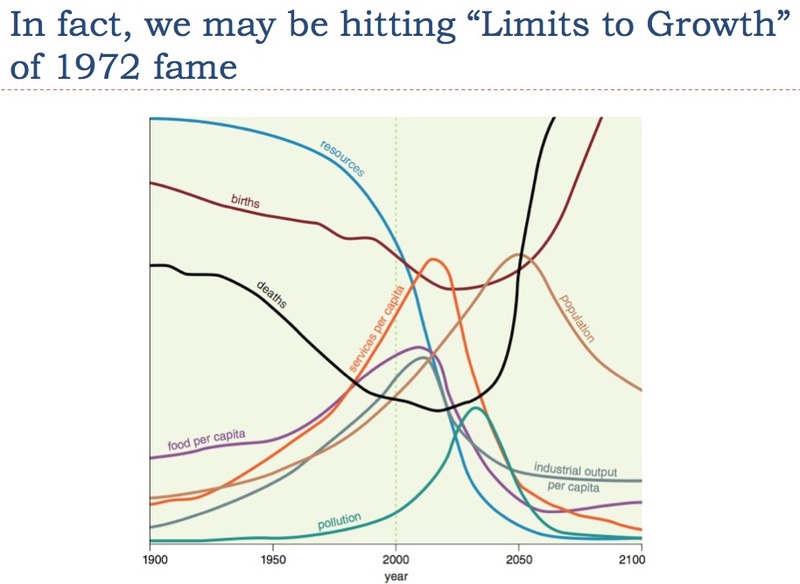 Slide 6 – The aim of the 1972 book Limits to Growth was to model the kinds of impacts that would be expected if the world attempts continue growth of resources and population within a finite world. Many scenarios were modeled. Most indicated that the world was likely to hit limits of many kinds, starting in the first half of the 21st century. 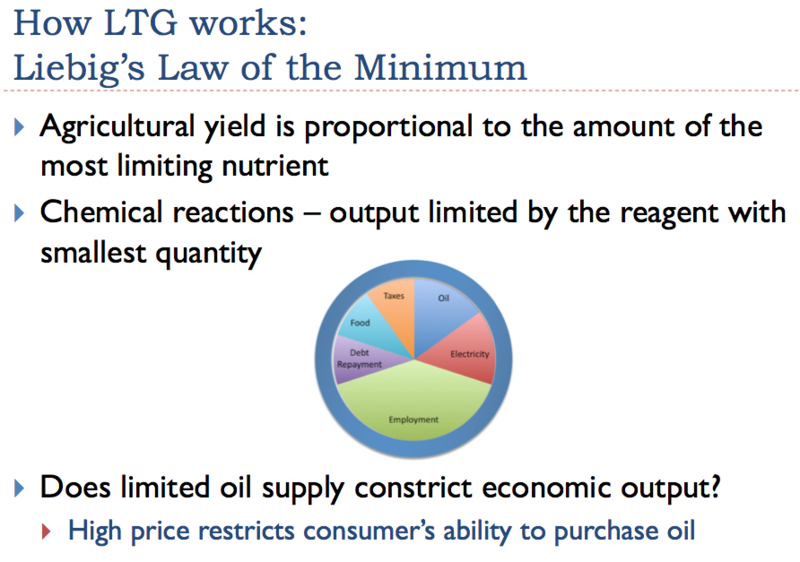 Slide 7 – In agricultural science, there is a principle called Liebig’s Law of the Minimum that says that the growth of a crop is not governed by total nutrients. Instead, crop growth is governed by the amount of the nutrient in scarcest supply. Thus, it is not possible to substitute, say, nitrogen fertilizer for phosphorous. A similar principle holds in chemistry experiments. If we are short of one reagent, it is not possible to substitute another reagent, and get the same reaction. Instead, we have to make a smaller batch. It seems to me that oil and the economy follows a similar principle. Oil is needed to run our cars and trucks and construction equipment. In the short run, we cannot substitute anything else. 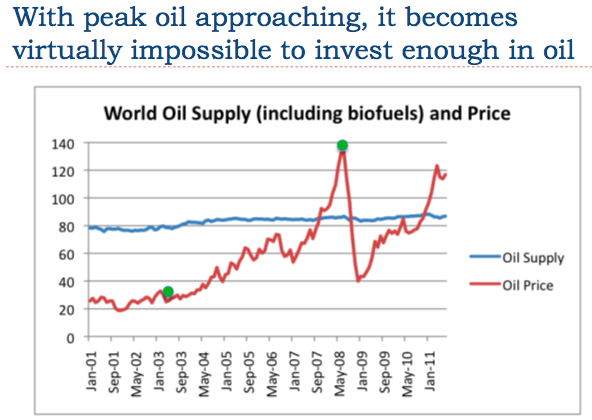 So if oil supply (including biofuel substitutes) is limited by high price, we find that the economy as a whole shrinks. In the 2008-2009 recession, we saw that electricity use shrank as oil use shrank, and we saw that many workers were laid off. This is the effect we would expect from the application of Liebig’s Law of the Minimum, if oil is an essential component of the economy. 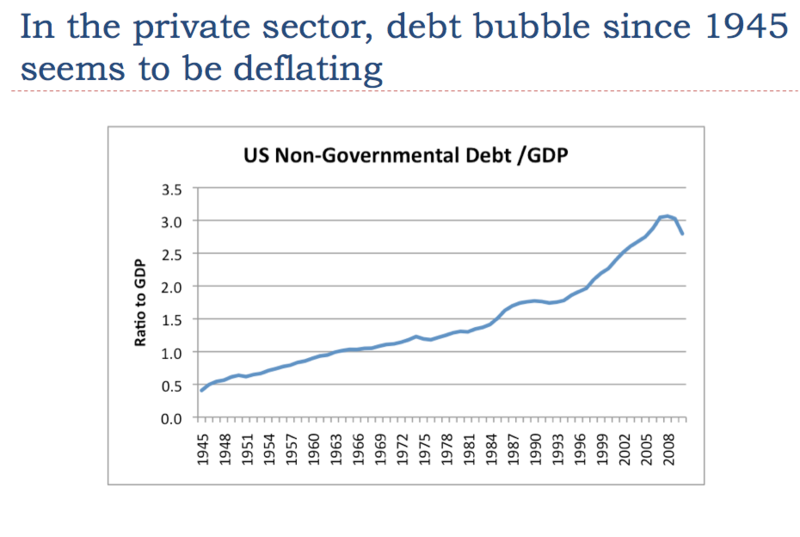 Slide 8 – Here I am showing the ratio of debt other than governmental debt to GDP. Growing debt helps pump up GDP, because GDP measures what people purchase, not whether funds were saved up in advance to buy these goods. For example, a person can get a car loan, and use this to buy a car, and this will help increase GDP. As far back as I could find records–to 1945–private debt has been rising faster than GDP. What we see in Slide 8 is a steepening of the rate of growth of non-governmental debt in the early 2000s, as the US government tried to keep economic growth rising, by keeping interest rates low and by encouraging borrowers who could not really afford to buy homes to buy them. With debt growing more rapidly, the home construction industry could be kept growing, even as oil prices would otherwise be dampening the economy. Even as debt grew, there was a conflict with rising oil and food prices. With higher oil prices, people had less discretionary income. One area consumers cut back on was buying higher priced homes, so the prices of homes started dropping, about 2006. With lower priced homes, smaller loans were needed. Higher oil prices caused the most vulnerable to default on their loans. Often, these were people with sub-prime loans. The Federal Reserve also raised interest rates in the 2004 to 2006 period to try to hold oil and food prices down, and this also contributed to lower demand for homes. Finally, in 2007 – 2008, non-governmental debt as a percentage of debt hit a plateau, (just as oil prices hit their peak) and started to decline in 2009, as many impacts of high oil prices were felt through the economy. The amount of non-governmental debt continued its decline in 2010, and into 2011. Such a decline, it if continues, will tend to hold down GDP growth in the future. 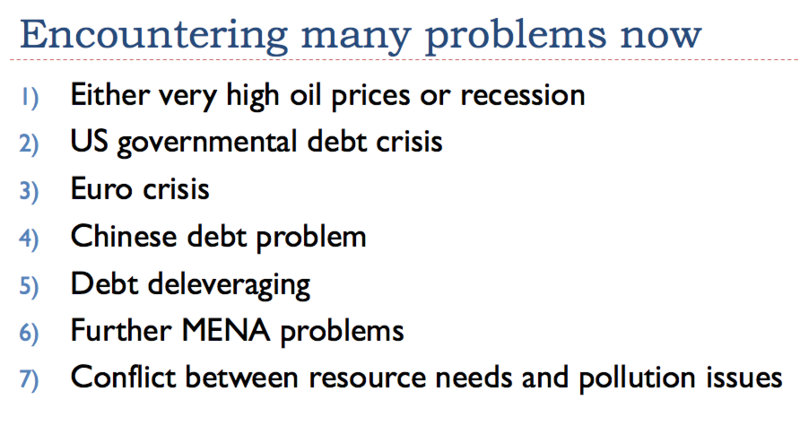 Slide 9 – The problems of the 2008-2009 are not gone; they have moved to the governmental sector. As non-governmental debt dropped off, the government has attempted to pick up the slack. 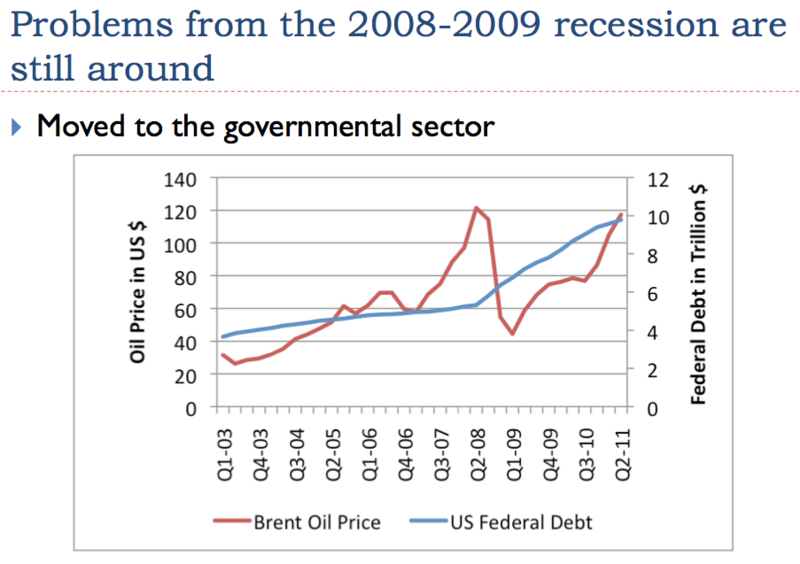 In fact, Slide 9 shows that governmental debt suddenly started to rise at exactly the same time that oil prices hit their 2008 peak. The increase in debt occurs because the government spent more for stimulus and bailouts and unemployment coverage at the same time tax revenue was falling. While all the government intervention prevented an even worse economic melt down, it moved problems over to the governmental sector, where they are hiding today. 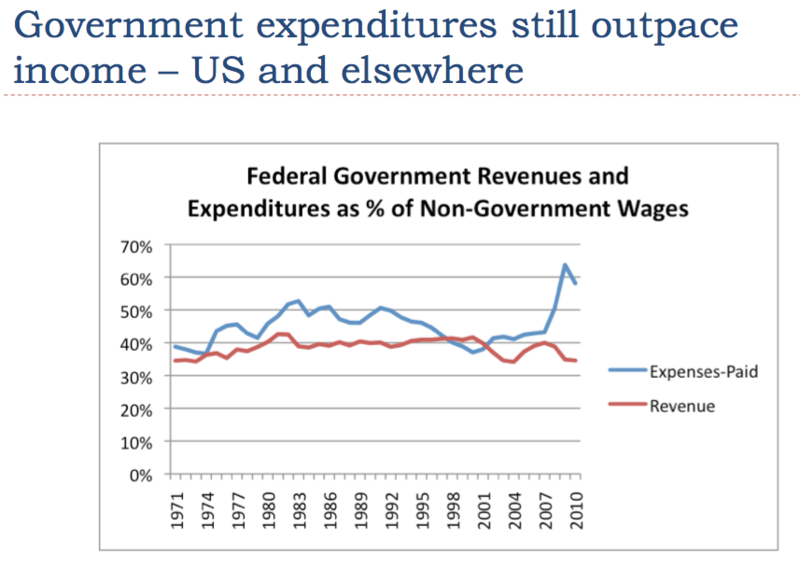 Slide 10 – Even at this point in time, governmental expenditures are vastly outpacing revenue, so the government is finding itself deeper and deeper in debt. It is hard to see a way for this situation to get better, because of the difficulty of going back to economic growth in the future, given our limited oil supply. Slide 11 – At this point, the world is hitting many problems, more or less simultaneously. It seems to me that the reason we are hitting so many at the same time is because oil limits are causing problems of different types in many parts of the world. One of the items I have listed where the connection may not be obvious is “Further MENA problems”. MENA refers to Middle East and North Africa. As oil prices rise, so do food prices. MENA is a big buyer of imported grain. When food prices rise, there is a tendency for populations to become unhappy, and even riot and overthrow governments, unless their subsidies are raised, or unless wages rise. The situation has not really improved from the situation in the spring of 2011. If food prices go higher, or if governments are not able to keep up benefits, more unrest is likely. In the context of all of these issues, what should we expect in the future? Slide 12 – This is the base scenario from the 1972 analysis again. As we can see, changes are expected in many areas, including the amount of resources extracted, number of births, numbers of deaths, extent of pollution, and other variables. All of the declines are not simultaneous. Since this is just a model, and the model does not include the financial system as it works today, it cannot be expected to be exactly right. But it gives us an idea that we can expect to see many interrelated effects that get more severe over time. 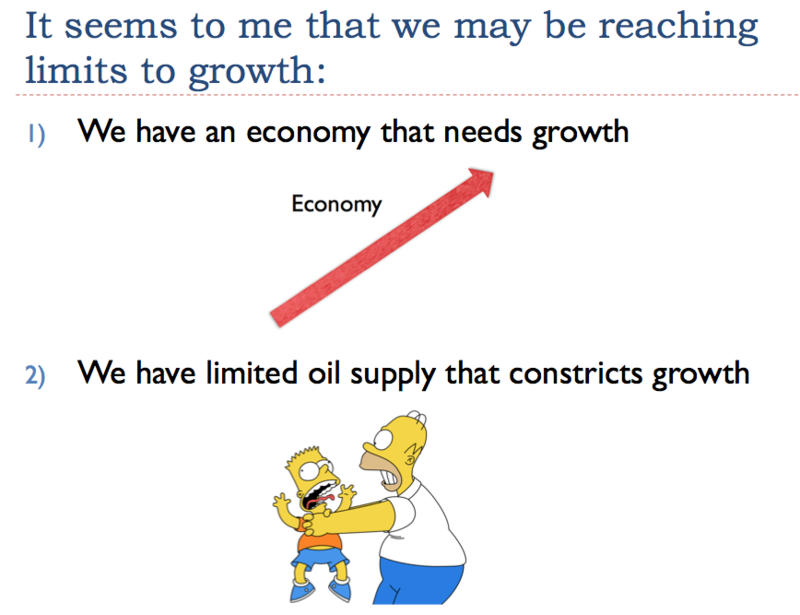 Slide 13 – Limits to Growth produces different kinds of effects than would be expected simply through reduced oil supply. One of the big issues is likely to be financial disruptions, because with lower, or even declining, economic growth, it will become more and more difficult to repay debt. Governments are also likely to have more debt defaults, because they are now shouldering a disproportionate share of the issues resulting from the higher oil prices. The possible future break-up of the Euro would seem to be one such impact. With increased debt defaults, there may be international trade problems. Countries that have recently defaulted on their debts may find the value of their currency dropping relative to the rest of the world, making the price of oil very high for them. There may also be a question of whether other countries want to trade with them, if the defaulting countries want to buy goods using still more debt. It seems to me that some imported goods from defaulting countries may become impossible to get, because of these disruptions. There are likely to be political disruptions, of the type we have recently seen in MENA countries. Britain has also seen riots relating to reduced social benefits, at a time of high unemployment and high foods costs. In some places, these political disruptions may lead to overthrown governments. In a few instances, countries my fall into pieces, as the Former Soviet Union did. New rulers may come into power, demanding a new constitution, and a new form of government. With all of these changes, even things we take for granted like electricity may become a problem. One problem may be that funds are not available to repair electric transmission lines after storms. Or repair parts may not be available when needed. Oil supply may also be interrupted, in unexpected ways. Governmental overthrows in oil-producing nations may lead to reduced oil imports. Unavailability of parts may cause production to be delayed, even for countries that are producing their own oil. We cannot count on the downslope in oil to be slow–indirect impacts may cause it to be quicker. 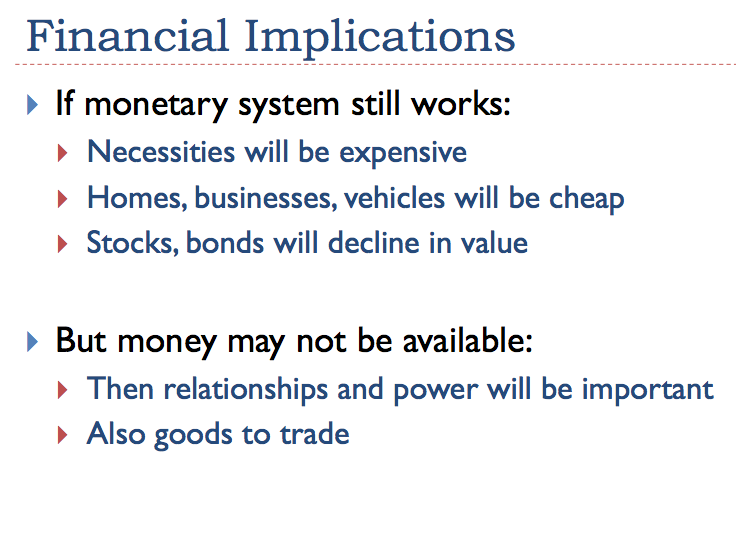 Slide 14 – It seems to me that if the financial system still works, the emphasis will be on necessities, like food and water and oil. These will be relatively higher priced than discretionary goods. High priced goods that are normally bought with credit are likely to be less frequently purchased, and may even drop in relative price. There will be more bond defaults. Stocks will tend to decline in price, because with little or no economic growth ahead, the present value of future earnings will be low. If for some reason money is not available, then relationships, and goods to trade, would seem to be important. 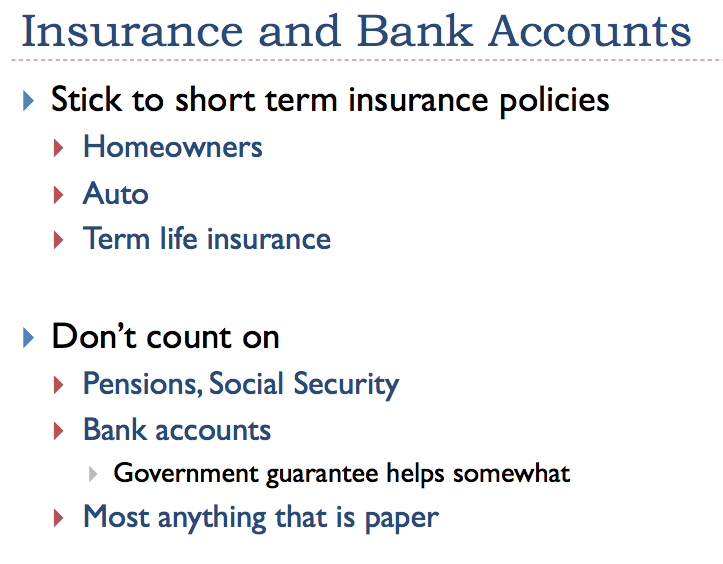 Slide 15 – In such a disrupted economy, short-term insurance policies, such as auto, homeowners, and term life insurance would seem to make more sense than other insurance products. As the world gets poorer, it will be less able to set aside funds for Social Security. Thus, cut backs seem likely. If there is a complete change of government, the program could even disappear completely. 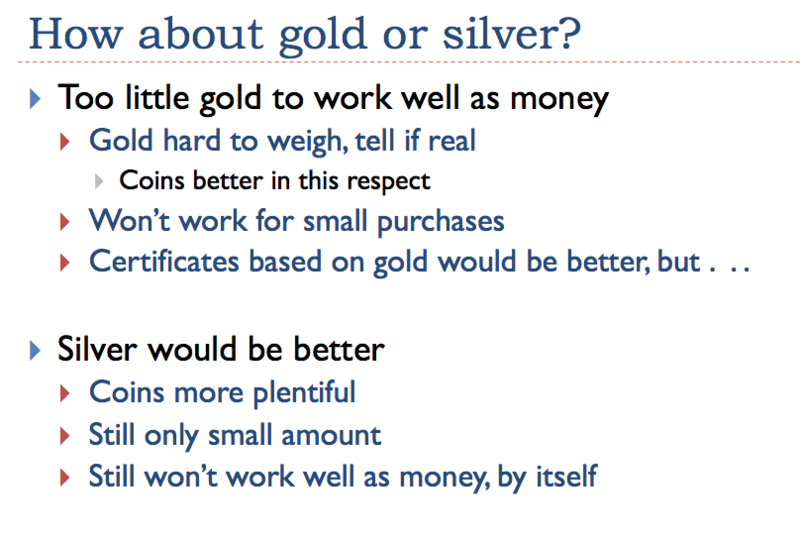 Slide 16 – People ask me whether gold or silver might be a good investment. Metals, in general, seem likely to better hold their value than paper securities. Such appreciation of metals on commodity exchanges only “works” as long as the current system holds together. The question then that arises is whether the gold or silver that has been accumulated can itself work as a currency, if the current US dollar runs into problems and no longer acts as a currency. When I think about the situation, gold or silver metal bars don’t work very well as currency, because of difficulty in determining that whether they really are what they claim to be. Silver or gold coins would be a little better in this regard, because then the amounts would be standardized, and there would be a greater chance that the metal is what it claimed to be. Another issue is whether a person can “make change”, so that it is possible to buy small things with the metal. It seems to me for this to work, there would need to be some paper currency based on the metal, which can be used for change. Gold in particular would be difficult for making change in, because coins don’t come in small enough units. Silver coins would be a little better for buying small objects, but even here, we would quickly run into the issue of not enough metal coins for all the needed small transactions. So it seems to me that metal would work as a currency, only if it is used to back some type of “paper currency” that could be used for everyday transactions. Another issue with trying to use gold and silver as alternate currencies is the fact that governments may not be happy with private citizens trying to usurp their role Governments may try to confiscate any gold or silver used as alternate currency. So in the end, while there is a chance that gold and silver coins may “work” for transactions, we can’t count on this being the case. They may work in individual instances—say for bribes of public officials, but not for such mundane purposes as buying bread. 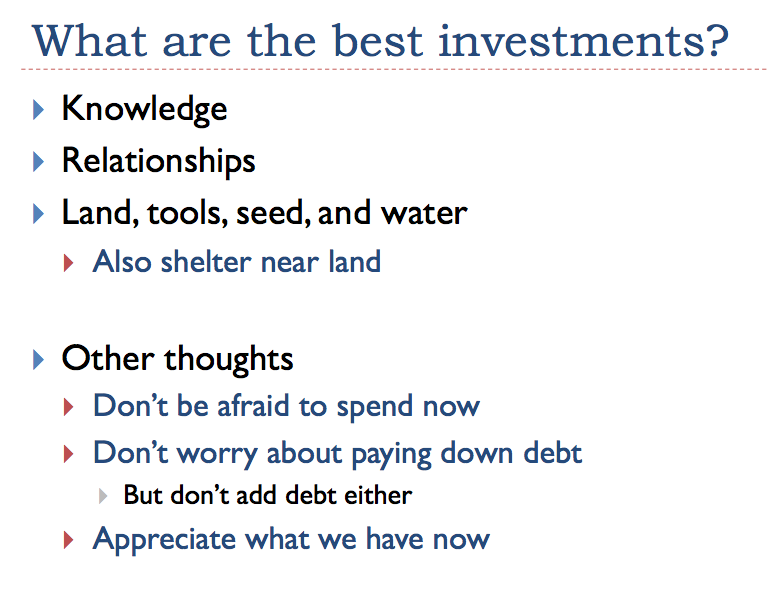 Slide 17 – So what are the best investments? Using money to learn a skill that you can use for the long term would seem to be a useful use of funds. It might also be useful to buy tools to use for gardening / farming, and land for that purpose. Even these uses of money are less than certain, however. Unless we can grow enough food for everyone, there is likely to be a lot of fighting. Also, without the right skills and a lot of nutrient recycling, farming is not likely to last for long. Life expectancies may very well be shorter in the future than today, and we may be less able to produce good and services than we are today. Thus, from a purely practical point of view, it may make sense to spend money we have saved now, rather than continue to save funds with the idea of being more able to buy goods and services in the future. If a person wants to see the world, or take advantage of other opportunities that are here today, today may really be the best opportunity a person has. People often seem to be stressed out about the idea of needing to repay debt. While it would be nice to repay debt, I expect that those holding debt will be the ones who take most of the “haircut” relating to people’s inability to repay debt. Also, as a practical matter, most people don’t have the financial ability to repay much of their debts. So my view (even though I am not an investment advisor) is not to get too stressed out about the situation. If you have some debt, just let it be, but don’t add to it with new purchases like expensive new cars, or sending children to expensive private colleges. At this point, our standard of living is close to as good as people have ever had it. Perhaps what we should be doing now is being thankful for what we have, and scaling back our expectations for the future. Most of us would continue to be happy, even if our standard of living drops a little in the future. This entry was posted in Financial Implications, Planning for the Future. Bookmark the permalink. Excellent. During the QA one member of the audience complemented the moderator and the panelists for a well run session. That was certainly true. It did start late perhaps contributing to your lack of time. At TOD you mentioned that you spoke to Dennis Meadows. Did he have any specific comments? I talked to him before I gave my talk. My talk was near the end of the conference, and I left almost immediately afterword. He wanted to learn more about my background and what I was writing about now. I am still lost. I understand why a failure of finance is bad for people who own finance company and shares of such companies. I understand that a finance system failure would disrupt trade. But I see trade quickly reestablished for oil and food and a bilateral barter basis. OK we may lose Chinese imports but that will make US jobs, net good. We can trade coal with Japan and EU for cars. I understand some countries without food or energy exports will undergo extreme hardship maybe even die-off. But just considering the US I think global systemic finance collapse could be net good. ???? One of the things that keeps our current system whizzing along is easy convertibility of one currency to another, with very small transaction costs. If Greece goes back to the Drachma, or even worse, Greece (or some other country) splits into several pieces, each with its own currency, then the system will have to decide how to honor this new currency, issued by a country with either no track record, or a very bad track record. Bilateral trade can admittedly be done, but how much does this change the system? Companies cannot plan on buying thousands of products from hundreds of suppliers around the world they way they do today, so there is likely be interference with “normal” supply chains. While it no doubt may be possible to do something more limited, it will not be possible to continue to add greater production of ever-more-complex products. Thus, economic growth will likely turn to major contraction, leading to even more debt defaults and government problems (too little taxes, too much outgo, riots, overthrow of governments in some cases). Let’s be honest: a lot of people have to die so many more can live. We can either let survival of the fittest be the path or we can plan it like the Nazis did. I am going to guess we end up with option one for obvious reasons. Fine with me. Lots of scum (which we have a plethora of in the U.S, probably a majority now) will kill each other off in the big cities, which is awesome, the lazy and stupid will starve. After my relatively short three decades living all over this country I can say with a certainty that this purge is needed. Oil made us rich but destroyed values and decency, especially in the big cities. Sadly, I agree with everything you said. Of course the smug anti-religious haters will mock me, but I sometimes wonder if this is God’s punishment upon a corrupt, selfish, narcissistic and lazy society. Wow, who made you God – “that this purge is needed” ? Are you really that special ? I am not expecting a big die-off in the US. We are in better shape than most countries. If there is a die-off I think the gangs in the cities have the skills and willingness to kill. I think they will do fine. It is not the meek that will come out ahead in a die-off. Of course the number one gang is the US federal government. They will take what they need even from you the hard working. I actually think much of the third-world could be in better shape. Certainly, Cuba has been through it already, and is poised to be in the best shape in the world in a post-petroleum sense. How dare you say that our living standards are better than we’ve ever had it? There are children of public Union workers in California without iPads! The travesty!